Judy Kaiser, 70, of Waldo, stands in the cold in 2011 in Searsport to protest a plan to build a large propane storage tank in town. Searsport Planning Board members are in an unenviable position. Facing strong opposition from local residents and those in surrounding communities, board members will have to decide whether to permit construction of a $40 million liquid propane terminal and storage tank. They deserve credit under these circumstances for doing their job and focusing on the project as it applies to town ordinances. If they deny construction, it cannot be because people don’t like — or like — the project. It must be because it doesn’t align with town rules, which are approved by residents. Board Chairman J. Bruce Probert hit the point exactly when he said, “We want the process not to deviate from the way we’ve done things” by not favoring input from opponents or proponents and following the zoning ordinance “right to the letter.” The board will be looking to see whether the application meets 18 performance standards as outlined in the shoreland zoning and site plan review ordinances. Denver-based DCP Midstream’s proposal to build the 138-foot-high tank, capable of holding 22.7 million gallons, has received approval from the Maine Department of Environmental Protection, Maine Department of Transportation and the Army Corps of Engineers. The U.S. Coast Guard has given its letter of recommendation. The Searsport Planning Board is the final hurdle. Projected to be built in Mack Point, part of Searsport’s industrial zone, it would join 30 or so much shorter tanks. Once the application is complete for local consideration, planning board members will hold a public hearing and enter a review period. So far they have begun collecting information in a thoughtful way and have all visited a similar facility in New Hampshire. And, as allowed, they have asked for outside help. They did an impact study on additional truck traffic on Station Avenue, a town road. In addition they will look at proposals that would study the project’s effect on tax revenues, property values, tourism and school funding. And they are working with an expert on liquid propane tanks who will be able to advise them on a variety of issues, including safety. Still, the reaction to the proposed tank has been widespread. The opposition group Thanks But No Tank! has posted pictures of fiery explosions on its website, which discusses at length the potential effects that locating an industrial facility close to a residential and commercial area could have. Residents and protesters have raised questions about the potential visual effect, odor, noise, safety and increased truck traffic. The Searsport Historic Preservation Committee has written to the planning board, concerned that more truck traffic will reduce the stability of buildings in the historic district. Stockton Springs selectmen sent a letter asking the planning board what the economic effect will be on surrounding towns and whether there will be an evacuation plan for them. Selectmen on the island of Islesboro raised concern about how construction of the tank would affect ferry and boat traffic on Penobscot Bay, in addition to air traffic and tourism. Belfast, Camden, Montville, North Haven, Rockport, Matinicus, Northport, the Penobscot Bay Alliance and the Sierra Club added their names to the list of concerned entities. Rockland councilors went in a different direction and approved a resolve expressing support for the greater use of propane to serve rural Maine. Concern or support may be warranted. 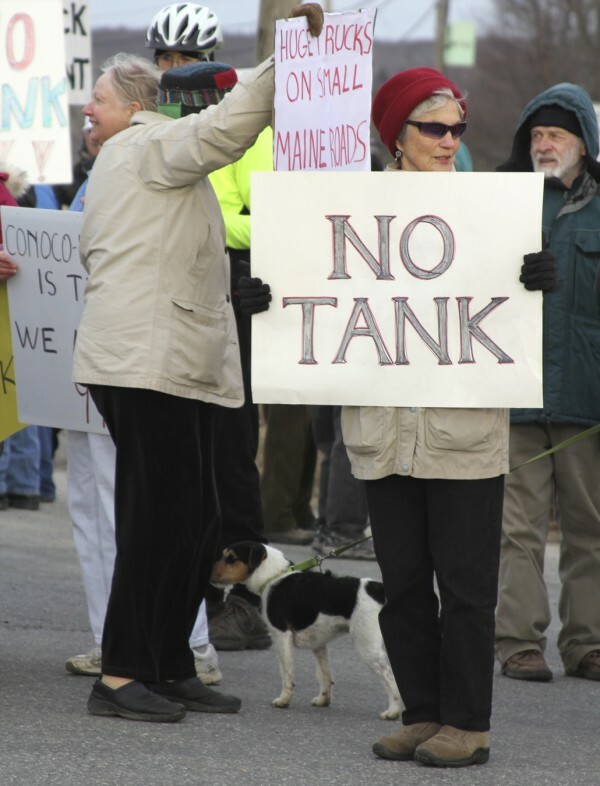 But no matter which direction the pressure comes from, the Searsport Planning Board must consider first and foremost whether the tank meets certain performance standards. Going through the application itself will be a challenge, as it’s more than 700 pages. But it should be done with an eye toward fairness, which means applying the rules at hand.